Well, that’s a crazy way to start a blog post, right? How to declutter your entire home in minutes will just about grab anyone’s attention even though you might be just a bit skeptical. I am here to make you a believer. Let’s get real for just a minute. I used to be a major league clutter-bug. Ever since I was a kid I would just move my things from this place to that place and call it clean. My mom even called me a “piler” and I believed if my crap was all in neat and tidy piles (no matter how big the piles was) I was fine. It was my calling card, my trademark. And one I took with me to my grown-up home. Even after I was married for 15 years I was still piling things when I cleaned believing my house was neat and organized. Never mind if I had 37 of those neat and tidy piles on my kitchen counters so cooking was nearly impossible. Or piles of clothes on the family room couch so the kids had to sit on the floor just to watch tv. Or piles of unfinished projects in my craft room that “I planned to finish someday” yet most hadn’t been touched in YEARS. But the best part (or so I thought) was those piles were so easy to hide whenever company would stop over. I could quickly shove those piles into drawers, cabinets, even under the couch! Within just a few minutes my kitchen looked absolutely presentable, never mind if I had pencils mixed in with my forks. The thing was, in the outside…everything looked neat and tidy and I was just fine with that. The problem was I forgot what was hiding underneath. Even worse, I left all of that crap tucked away and proceeded to, you guessed it, make all new piles. It was a vicious cycle that soon got completely out of control. After a particularly frustrating weekend of lost papers in those piles that resulted in a heartbreaking moment for one of my sons, I realized it was time to stop. To clear it all out once and for all and get it gone…….FOR GOOD. I needed to get my home, my family, and my life under control. It was time, and I was finally ready. Hey, I get it. Listening to me tell you we are going to declutter your home might just make you want to delete this article and go back to your life ignoring the mess that is all around you. But, you don’t have to!! I found a way to remove the stuff from my home without turning our lives upside down…even with 4 small boys in tow. And if I can do it…….you can too. How to declutter your entire home in minutes. Step #1 – Keep it simple. This is actually my superpower (who knew!) and one I now rely on with any project I tackle. As long as I am keeping it simple and not overthinking it I can accomplish just about anything. This is especially true with decluttering. Keep your eyes on the task at hand rather than the entire goal and you will get more done and make more headway than you ever thought possible. 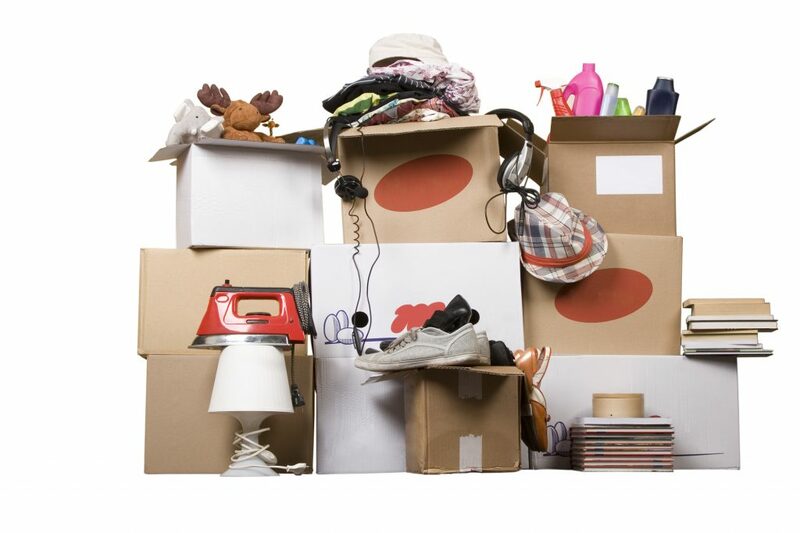 By setting and accomplishing a small portion of your decluttering project every single day. Rather than cleaning out the entire kitchen this Saturday and running the risk of burn out or failure, you will instead tackle a drawer or cabinet each day for the entire week. Trust me, a 5-minute drawer purge is a heck of a lot easier than a 7-hour room clean. And the best part is, when you tackle large projects in bite-sized pieces you LEARN how to live on less. And that right there is the game changer you have been looking for. As you move along one drawer or one cabinet at a time, you will evolve into a clutter-free mindset that will stick with you like glue….for years. Sure, it sounds easy enough but how does this all work? Each day I want you to choose an area of your home that you are going to declutter. The silverware drawer, the top shelf of your front closet, that basket of magazines by the toilet, or the glove box in your car. The trick is to choose small areas that can be accomplished during your day without upsetting your day. I call these Daily Decluttering Goals or DDG’s and these are something you can either choose at the beginning of the week or at the beginning of your day. Make sure that each DDG you choose is something that can be accomplished in just minutes so that no matter how crazy your day is you have time to get your DDG done without pushing you over the edge. We want to fit decluttering into your day not your day into a decluttering project. Sure it takes longer this way, but by doing things slowly and intentionally you are making a lifestyle change and not just a room change. This is the key to you not getting overwhelmed by the process. In the beginning, you might need a bit more time, but no more than 10 minutes….TOPS. As you hone in on your mad decluttering skills you will find the time shorten to under 5 minutes…EASY. Don’t believe me? Let’s run through this quick. Your daily goal is to clean out one drawer anywhere in your home before the day is over. It is the end of a long hard day and you are cooking dinner. You open up the drawer to grab a spoon to stir the spaghetti and find the one you need. As you are cooking you clean out that drawer removing things you haven’t touched in years. You grab a sponge and wash it out and put back the pieces you use regularly. The pieces you removed are put into a shopping bag and set aside by your purse so you put it into your car to drop off at the donation center on your way to work the next morning. And all of it was done while you were cooking dinner. I like to call this distracted decluttering and it’s a great way to clean things out without the overwhelm. When your head is focused on something else, like cooking dinner, you can make decisions without freaking out. Not sure what decluttering tasks can be done in just minutes? Read this post for ideas! Step #3 – Don’t forget!! I am notorious for forgetting things. And to this day that is something I have not been able to change. To help I have found ways to set up reminders that will give me a little “nudge” to get that mental fog out of my head so I can remember what needs to be done. My phone is my virtual assistant and a great way for anyone to stay on track. Each day set a reminder for the DDG (Daily Decluttering Goal) of the day that you have set up. I would suggest in the beginning to set two reminders. One for the morning and one for the evening. This alarm is your nudge to get moving and don’t worry if you need that alarm for the next few weeks or even months. Whatever it takes to clean things out is your key to making this all work for you. And if a little alarm is what helps…then, by all means, use it for as long as you need to! This system might be quick but that doesn’t mean it’s painless. Now is the time to be ruthless especially in the beginning. I call this “Taking out the trash” and it’s a super simple way to make a dent fast. When decluttering anything you should always start with the trash first. This will not only give you a motivational boost but uncover the real clutter underneath. This one step alone should just take seconds so don’t overthink it. Just toss and go. This step is always where you start first, not matter if you are decluttering an entire cabinet or just a small drawer. Think TRASH FIRST – THINGS SECOND. Once you have all the trash gone you can then focus on what is left with a bit more intention and focus. Step #5 – Let the system work its magic. Now that you have the basis for how things work, you just need to set it up and follow it. A simple planner page will work along with a reminder on your phone. I have a page you can snag right here to help you set up your goals right away. Place this sheet in a page protector and put it where you will see it like in the kitchen or on the wall of your bedroom closet. Keep it front and center as you instill this system into your daily routine. FIRST: List your 3 big decluttering goals for the week and then list small steps you can accomplish in just a few minutes each day. 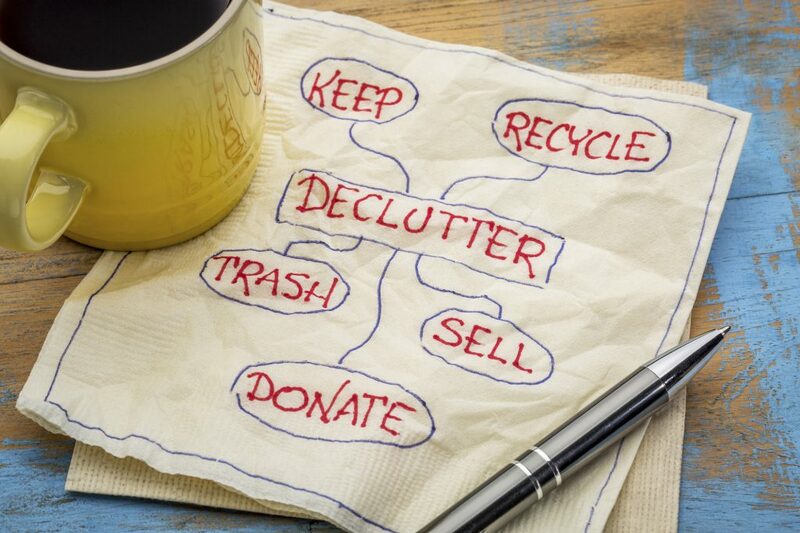 These are your Daily Decluttering Goals or DDG’s. If your goal is the pantry, then a shelf a day is completely reasonable. If your goal is your movies in the family room, then you can sort and purge while watching a movie over the weekend. If your goal is your bedroom, then a section in your closet before you head off to bed is something that won’t overwhelm you. SECOND: Write up your list and post it where you will see it every single day. Use a bright highlighter to check things off as you go. There is crazy motivational power when you check things off, so make it clear that you have completed something so you can see it. THIRD: Set a reminder on your phone so you do not forget. Tell yourself that your reminder is something that is set in stone and cannot be ignored. It’s only 10 minutes remember and you can do just about anything if you know ahead of time it will only take minutes to accomplish. FOURTH: Rinse and repeat. Do this system every single week for the next month and see how it works for you. Not fast enough? Add more goals to your week. Too much? Then choose easier goals as you get used to the process. The DDG’s need to fit into your schedule so choose them wisely. After doing things this way for over a decade I can honestly tell you it is life changing. The best part of this system is, it is contagious. As you see things begin to take shape you will catch the bug and find yourself cleaning out things as you go. The sock drawer while you are getting dressed in the morning or below the bathroom sink while your little one is playing in the tub. The glove box as you are waiting at school to pick up the kids or your wallet while you are standing in the checkout lane. This is called instilling systems and they are the game changers you have been looking for. Think you can learn how to declutter your entire home in minutes? Give it a try and let me know! Step one seems to be missing. Also, there are some “links” showing up that are a bit confusing.Otherwise, good post. Looks like my computer ate some of my article. Thank you for letting me know……. Correcting it now. Oiy, technology truly does hate me! Ive been decluttering for about 6 months now. My bathrooms are the cleanest and most clutter free rooms of all my house. I have 4 kids, 2 of which need my supervision during bath time and I have 3 bathrooms. I just give them a bath in a different bathroom everyday and i clean the bathroom while they’re bathing. Now I am trying to get my bedroom under control. My oldest son keeps his bedroom immaculate. My middle son cleans his every week but it gets very messy between cleaning, but I’ve still got to clean the nursery and my little girls room and they got crazy because my father in law and my dad passed away within a year and we were baby sitting, planning and supporting and grieving and all the things that stop you in your tracks. So my bedroom is chaotic. I clean one room per day and fill up diaper boxes for donations as I go but my room is taking forever to get where I want it. Plus my husband likes to keep huge room hogs that make me feel crowded out, like cabinets that we dont use, Even dishes but he doesnt do any cooking. I thought I would fall out when he donated a bunch of his hats. Its a slow process but I will keep moving. I can see that my kids have been inspired as my oldest son emptied an entire drawer of toys and donated them to goodwill. I think eventually it will be second nature to say,’well, this no longer serves me lets donate it to someone it can serve.’ I just want to feel at home in my house. You know? It sounds like you are doing a really good job! 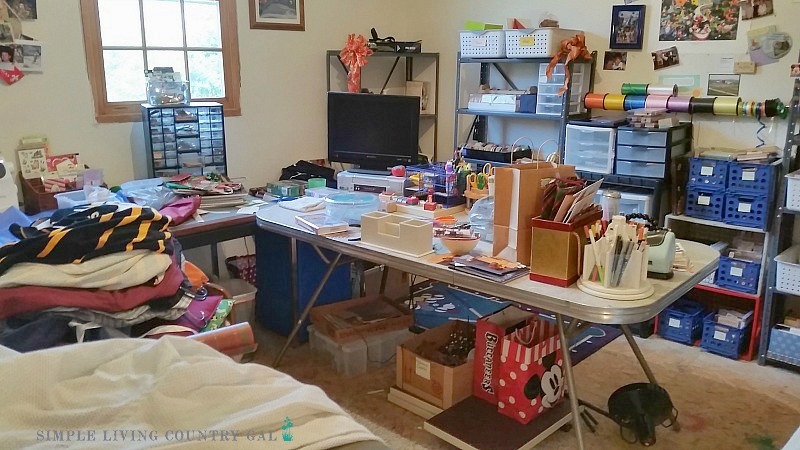 Decluttering is hard when you have oodles of kids, haha, I know that! Just keep plugging away and you will be there before you know it! I love your tip about cleaning the bathroom while the kids are bathing. Brilliant! !